Even if you plan on switching to a fully-wireless network, you will still need structured cabling. When it comes to network cables, you want to be sure the infrastructure you assemble aligns with your long-term voice and data goals. For example, if you plan to implement a VoIP solution you’ll want to run Cat5e or Cat6 cables. Additionally, no matter how large your business is, you’re bound to need multiple cables that connect all of your equipment. And even if you plan on switching to a fully-wireless network, you will still need structured cabling. The cables and associated technology that you choose is imperative for ensuring your organization continues its rapid growth. The entrance facility is where the external cables serving your building meet the network cables that your business owns. Cables, connectors, and devices for maintenance and shielding are normally found in this part of the structured cabling system. No matter where the entrance facility is located, you must do your best to ensure it is shielded from possible interference due to the structured cabling systems used by other nearby businesses. As you might imagine, the backbone cabling serves as the hub that collects the information traveling back and forth. It links the telecom centers and workstations with the entrance facilities leading in and out of your building. Backbone cabling can also connect more than one building on the same business campus. 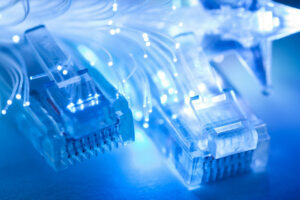 The telecom center of your building or office is also known as the telecommunications room. This room stores all of the equipment you need to establish stable hardline connections between the horizontal and backbone cabling. Each level and floor of your building should have its own telecommunications room to achieve the best results. Workstations are one of the most critical elements of the entire structured cabling build-out. Here you will find the outlets, cables, and adapters that serve each employee, along with computers, landline phones, and printers. The tech closet is also known as the equipment room. Here is where you will find the servers, routers, and switches that can ideally serve the entire building so well that you will not need a telecom room for each floor. In some cases, the tech closet or equipment room can also be the entrance facility for the building. Be sure that your building has at least one tech closet. Depending on the size of your company, you may need more than one. ACC Telecom provides voice communication and cloud-based solutions tailored to the needs of your business. We have over 38 years of experience in the telecommunications industry and pride ourselves on offering customers top-notch service and affordable prices. To get a quote or learn more about how we can help your business grow, give us a call at 410-995-0101. For more interesting articles and tips, follow us on social media on Facebook, Twitter, LinkedIn, YouTube, and Google+. This entry was posted on Thursday, April 5th, 2018 at 3:06 pm. Both comments and pings are currently closed.